We were wary. In 2015, we almost missed seeing Machu Picchu because of endless fog. A few months after that, we trekked to Torres del Paine in Chilean Patagonia to find it completely shrouded in cloud – a disappointment that haunts Peter to this day. New Zealand, named one of Lonely Planet’s best countries to visit in 2018, is a place of boundless beauty and we didn’t want it tainted with a bittersweet memory. We couldn’t possibly finish our 15-day tour without seeing the glacier. 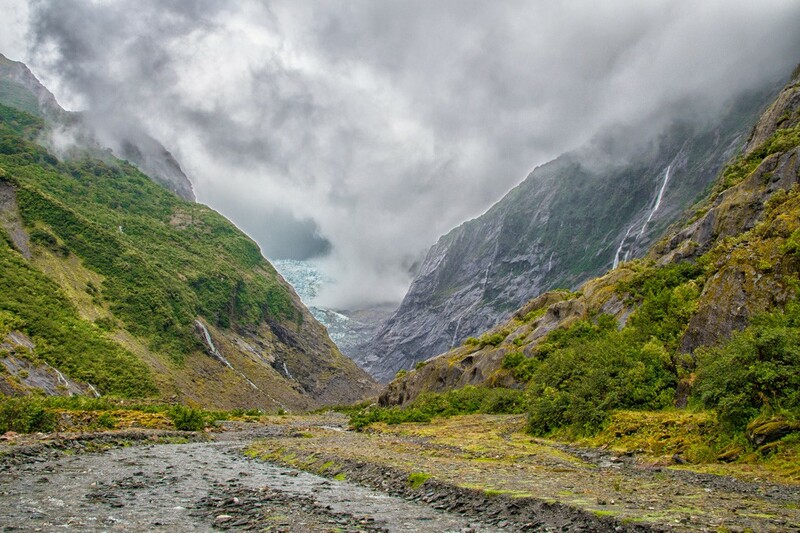 Located in Westland Tai Poutini National Park on the west coast of South Island, Franz Josef Glacier was almost named after Queen Victoria. In 1852, European explorer Leonard Harper named it after the British monarch, but did not formally register this name. In 1865, geologist Julius Von Haast named it after Franz Josef I, Emperor of Austria, and the local village later took its name. The glacier once stretched from the mountains right to the sea. 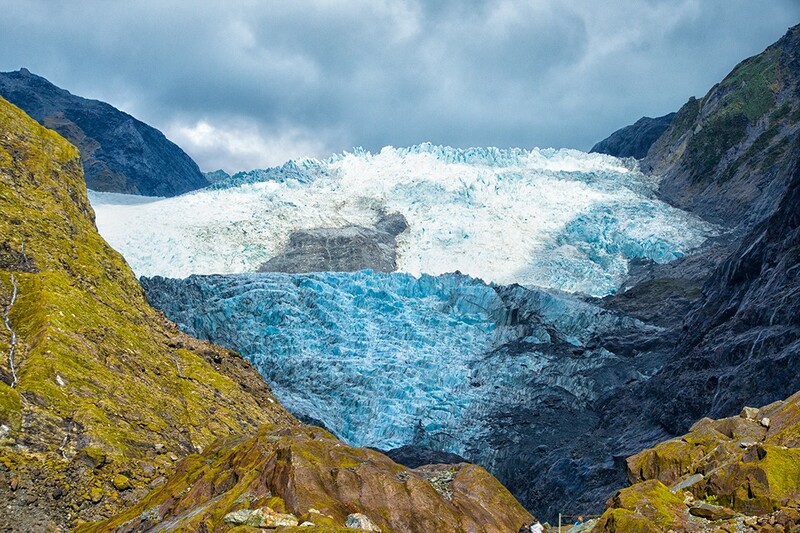 Following millennia of retreat, the glacier is now 19km inland and accessible only by helicopter. With our heli-hike cancelled, our only option was to hike to a viewing point close to the terminal face. 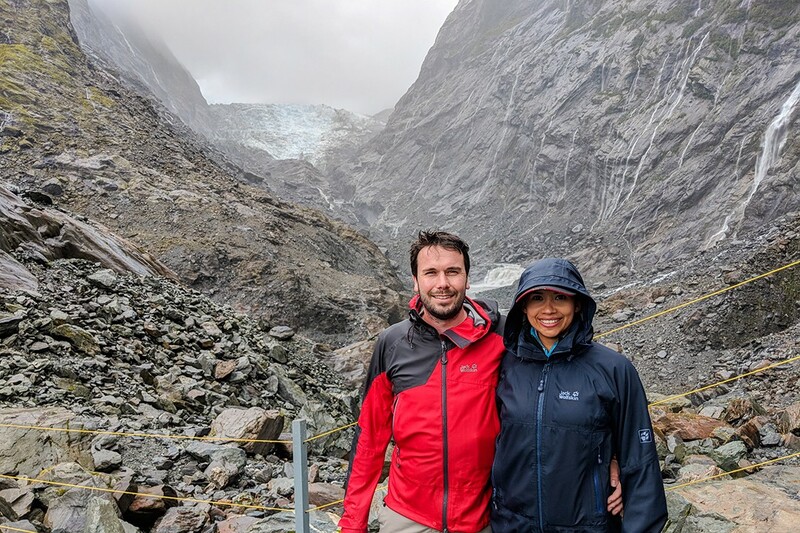 There are various hikes available, but given the dismal weather, we decided on the straightforward Franz Josef Glacier Valley Walk, a 5.4km return trip over rock and shingle. We headed to our hostel reception to book a shuttle for 3pm when the weather would supposedly clear. There, we learned that a shuttle was leaving imminently (at 1pm) and we made a snap decision to join it despite the early departure. When we arrived at the glacier car park, I noticed that Peter was in an unusually sour mood. (I’m usually the moody one in challenging weather.) He was frustrated because we hadn’t stuck to our plan. The rain was heavy, the clouds were thick and there was little chance we’d see the glacier now. As I said in Love at first hike, sometimes when your other half is finding something difficult, you have to buck up and be the strong one. As such, I tried all my tricks: a winning smile, a panoply of questions about his favourite subject (mountains of course), and repeated assurances that we could wait for two hours at the viewing platform to see if the weather changed. Alas, rushing to join the earlier shuttle meant we were under-prepared. Peter’s jacket and top were soaking and we hadn’t yet had lunch. We trudged on in fraught silence. The skies darkened and the rain droned on. We walked along the riverbed, scarcely stopping to appreciate the scenery: surely stunning under good weather, but foreboding under bad. Soon, we reached the Waiho River crossing, which was ankle deep in the rain. Several walkers turned back at this point, but we trudged on, soaking our boots and socks in the process (my beloved waterproof Anatoms were at home in the UK). With dwindling spirits, we walked on. Forty-five minutes after we started, we reached the viewing platform and saw… barely anything. There was a discernible portion of the glacier’s terminal face, but having seen the extraordinary Perito Moreno Glacier a few years earlier, Franz Josef in its current guise was distinctly underwhelming. We spent a while desolately taking photos, blinking rain from our lashes and huddling into our jackets. We debated whether or not to wait. Based on the shuttle times, our options were to either leave now or commit to another two hours. Peter was cold and wet and I was hungry and needed to pee, so we decided to turn back. We trudged back across the river, but I kept turning around longingly, willing the cloud to clear. We paused at a cluster of rocks and forlornly split a banana. After a discreet bathroom break, I felt better and told Peter that I thought we should stay. I used his own motto against him: 20 years from now you will be more disappointed by the things you didn’t do than by the ones you did do. 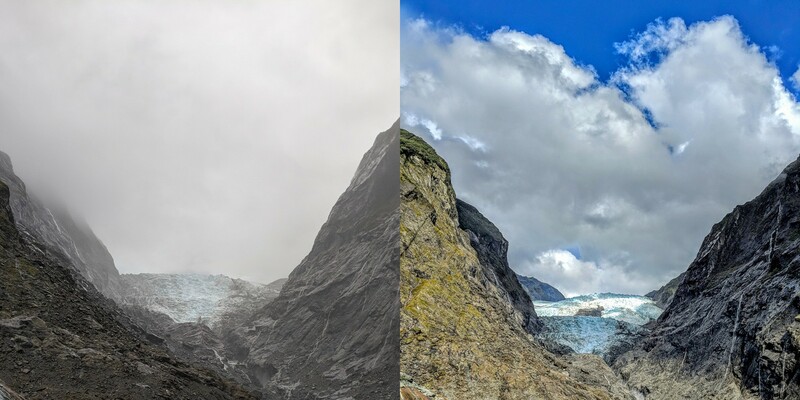 If we left New Zealand without seeing Franz Josef Glacier, wouldn’t he always wonder if the skies had cleared? We settled in and waited. Slowly and in stages, the sky cleared and there emerged the glacier soaring 300m above sea level. We were delighted. Franz Josef Glacier didn’t usurp Perito Moreno, but it was stunning nonetheless. We watched it shapeshift before our eyes, now an insipid white, now a playful blue, its crevasses glinting like polished glass. The weather wasn’t perfect, but it was good enough. As it happens, by 3pm, the clouds rolled in and obscured the view once again. 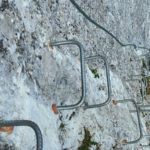 Had we stuck to our original plan, we would have missed the glacier altogether. Our decision to wait was perfectly justified. And the best thing about it all? I’m no longer the only one who gets moody in the rain and you can bet I’ll be mentioning that the next time Peter tells me to buck up on a challenging walk. 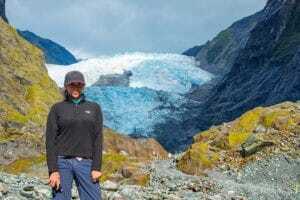 What: Franz Josef Glacier Valley Walk as part of a G Adventures 15-day South Island tour. 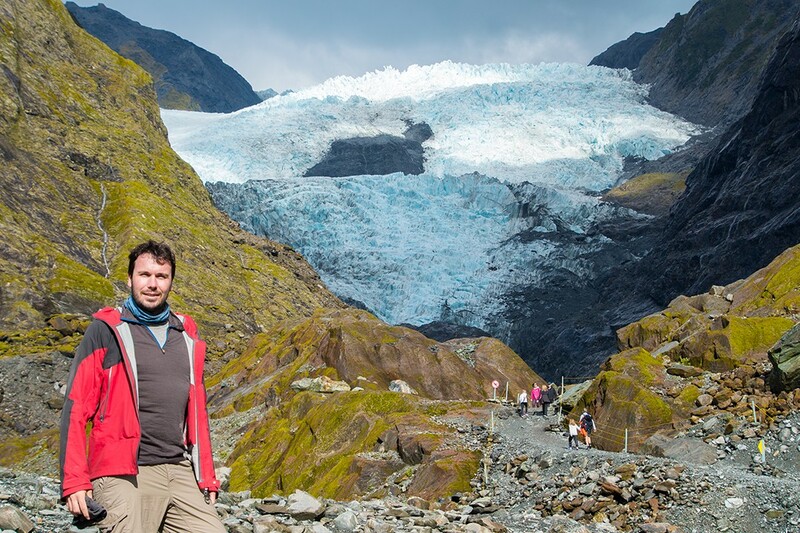 How: The Franz Josef Glacier car park is 5km from town. You can walk, drive or take a shuttle. 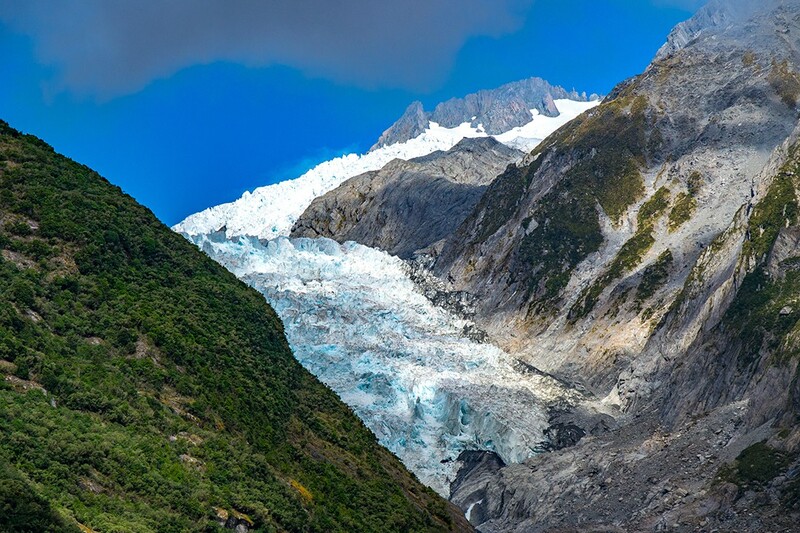 From the car park, follow signs for the Franz Josef Glacier Valley Walk. We explored New Zealand’s South Island on a G Adventures 15-day South Island tour, priced at £2,149 GBP or $2,792 USD per person (depending on dates) for a 15-day trip from Wellington to Wellington. 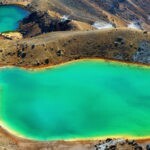 The itinerary takes in Abel Tasman National Park, Franz Josef and Queenstown among others. 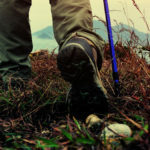 The price includes a chief experience officer (CEO) throughout, basic breakfasts and several meals, and numerous activities including hiking, kayaking and cycling. Optional activities include Franz Josef Glacier heli hike, skydiving, bungy jumping, canyoning and via ferrata among many, many others. For more information or to book, call 0344 272 2040 or visit gadventures.com. We flew from the UK to New Zealand via Singapore and Australia. Book via Skyscanner for the best prices. Lonely Planet New Zealand is a comprehensive guide to New Zealand, ideal for those who want to both explore the top sights and take the road less travelled.